Cannes Lions is getting ready to make its annual roar. The International Festival of Creativity inspires creative bravery that changes the course of communications and the annual awards distributed set a global benchmark for what good creative looks like and connects those with a similar vision. This year's event features speakers who range from Al Gore to Sir Martin Sorrell to Jamie Oliver, and takes places June 21 to 27 in Cannes, France. As usual, LinkedIn will be there. Every year at Cannes Lions, we choose a theme related to the overarching festival theme of creativity and invite our agency partners from around the globe to contribute relevant content. This year, the theme is Creative Effectiveness. In addition to being one of the award categories at Cannes, this theme of Creative Effectiveness has powerful, visceral meaning to advertising and marketing agencies. Creative Effectiveness is at the heart of their businesses and of what they offer to their clients, whether they’re B2C, B2B, or a mixture of the two. 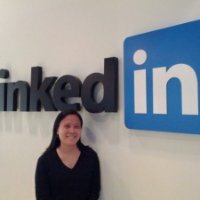 Creative Effectiveness is also closely aligned with LinkedIn Marketing Solution's mission to be the most effective platform for marketers to engage with professionals. 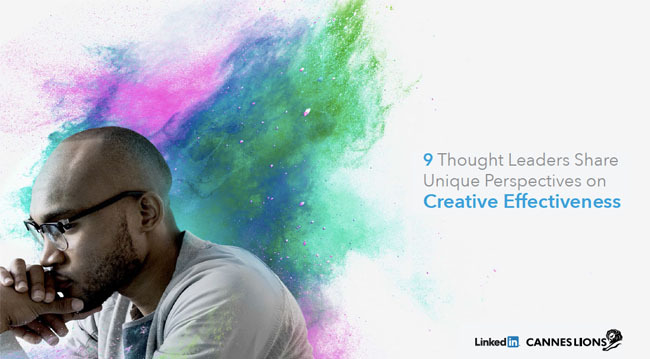 Our latest SlideShare, 9 Thought Leaders Share Unique Perspectives on Creative Effectiveness, features industry luminaries sharing their ideas on Creative Effectiveness. Read on to see how Rik Haslam, Executive Creative Director at RAPP, Alexander Jutkowitz, Managing Partner Group SJR, Jerry Daykin, Global Digital Director at Carat, Toto Ellis, Head of Strategy of Droga5 Europe, and others conceptualize the nexus of creativity and effectiveness. If you’re attending Cannes Lions this year, make sure to stop by the LinkedIn Clubhouse, where we’ll be sharing more content from agency partners that dives deep into the concept of Creative Effectiveness. You can also stay connected via our Cannes Lions content hub, and on Twitter @LinkedInMktg using the hashtag #ConnectInCannes. Subscribe to our blog for more details on where to find the LinkedIn team at Cannes and fast follow takeaways from the event.